I am very much a planner. Somewhere in my head I believe if I plan enough, the chances of things going wrong are lessened. That’s probably not true but it sure makes me feel better. My husband’s birthday was coming up and his favorite cake is German Chocolate with Coconut Pecan frosting. Being the planner that I am, whenever the local grocery store runs a sale on cake mixes for something like $1.00 a box, I stock up on as many as I can buy so whenever I need a cake mix, I have one. So knowing I would have the cake mix I needed to make my husband’s birthday cake, when I was at the store, I only bought the jar of Coconut-Pecan frosting. Of course, this was the night before jos birthday and I’d planned on baking his cake while he was out fishing the next day BEFORE I left to spend the day at the zoo with my friend. But as Murphy’s Law will have it, I had almost every flavor cake mix EXCEPT for German Chocolate. What to do, what to do? After examining the cake mixes I had, White, Yellow, Lemon, Spice, Carrot, it dawned on me I could just add cocoa to one of the mixes and make my own chocolate cake. I chose the Spice cake mix and I couldn’t be more pleased with the way it turned out. 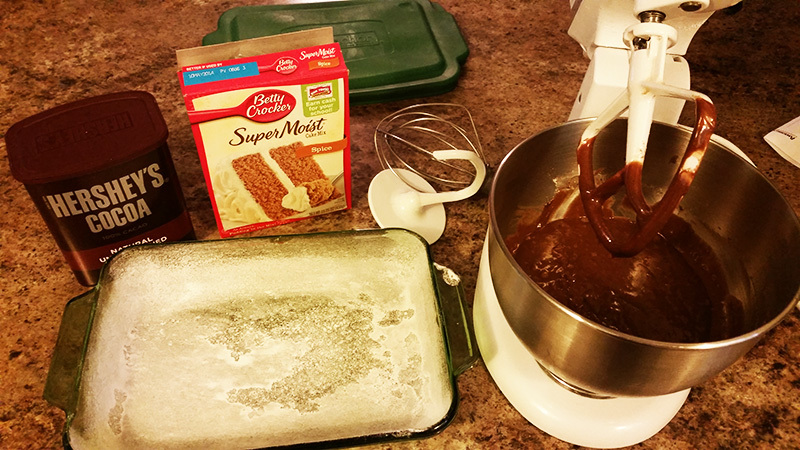 To turn the spice cake into a chocolate spice cake, I simply added cocoa. 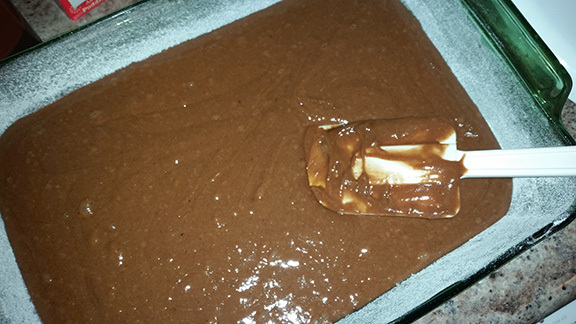 In addition to adding 1/4 cup of cocoa, I got a couple of other really great ideas from Rachel Ray’s website, She has a video showing ways to enhance boxed cake mixes. Two of the suggestions were to substitute melted butter for the oil and using hot water instead of cold. The hot water reacts with the cocoa and enhances the chocolate flavor and using butter instead of oil adds more flavor (not to mention butter is a whole lot more appetizing than oil). To check out her other great tips click here. I also added about 3 additional tablespoons of flour to upsize the mix just a bit. I baked it according to the directions on the box and when the cake had completely cooled, I iced it and waited patiently for our dessert time to serve it with a scoop of ice cream. Yum! This looks both delicious and easy to make! 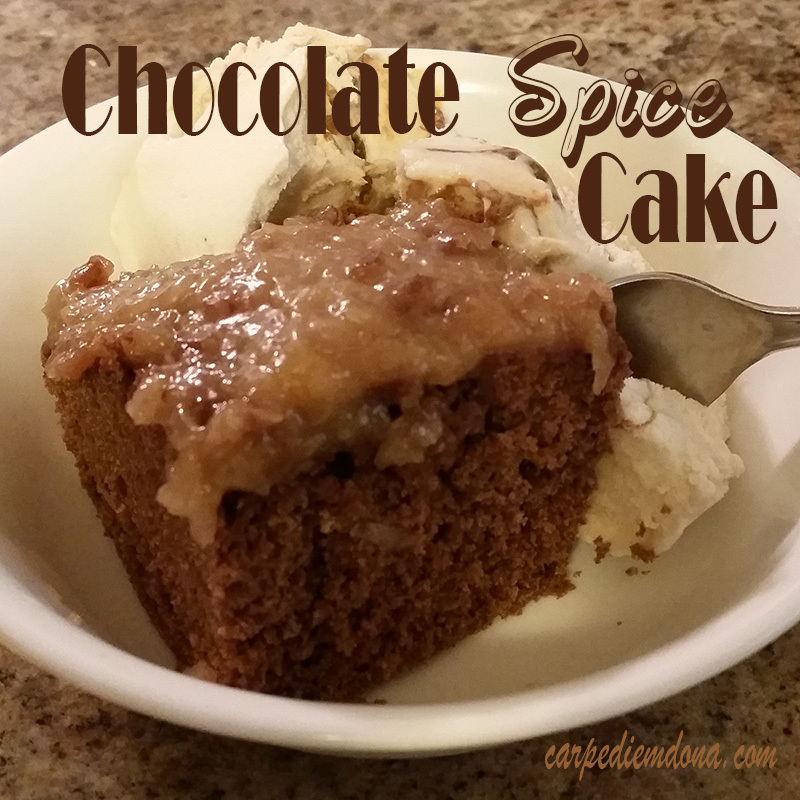 I’ve made Apple Spice Cake before, but I have never tried it with chocolate. I’m definitely going to have to try this!